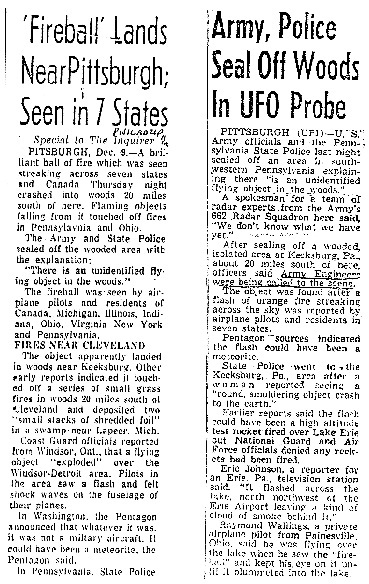 Left: The Philadelphia Inquirer, December 9, 1965. Right: Boston Record American, December 10, 1965. To be more computer-friendly, the reprint has been divided into parts. Here begins Part 13 of Status Report VI, from July 1991. These status reports were written by Leonard H. Stringfield from 1978 to 1994. Previous Status Report VII begins at Earthfiles 12/15/03. Leonard Stringfield died on December 18, 1994. 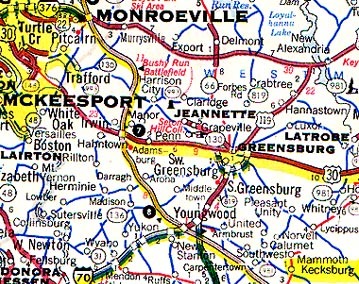 Kecksburg, Pennsylvania, is about 35 miles southeast of Pittsburgh, Pennsylvania. 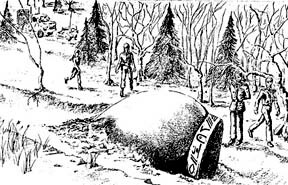 Witnesses claim to have seen a metallic acorn-shaped object with strange markings in the Kecksburg, Pennsylvania woods on December 9, 1965. Drawing by Charles Hanna © 1998 by Stan Gordon Productions.